You may be wondering what happened to your exhilarating, weekly report about the education reform circuit. Well what happened is easy to explain. 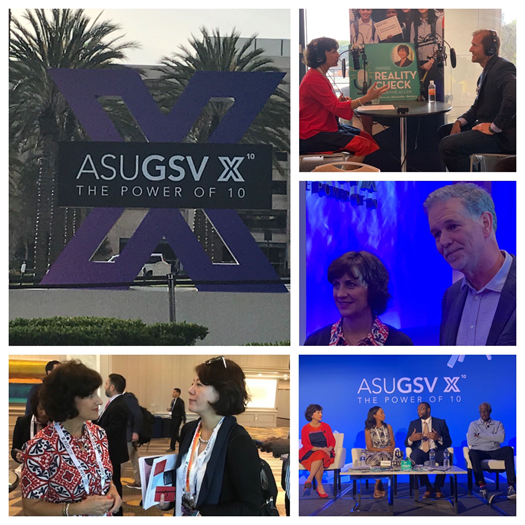 We were disrupted this week in the best of all ways - by thousands of CEOs, leaders and ed tech innovators who gathered for ASU GSV X, the world’s leading education and workforce summit. It’s the tenth annual summit, where leaders who are carving out new, accelerated paths to improve the “Arc of Human Potential” unite to conquer. And the global diversity was palpable. While hallways of the Manchester Grand Hyatt in San Diego were buzzing all day with sidebars and small conversations, on stages the summiteers were challenged by leaders like the inspiring president of Arizona State University, Michael Crow, who with the CEO of Starbucks and major investors demonstrated how we can treat employees not as “commodities,” but as “lifelong learners.” Giving them access to an education is the just the start. We heard research that shows that Student happiness is directly correlated to school climate. Emotional intelligence matters, Yale’s Marc Brackett , showed us. We heard from the unicorns of ed tech companies that are changing the way education is delivered and expanding its potential infinitely. Check out Coursera’s Jeff Maggioncalda, VIPKID CEO Cindy Mi, Markus Witte of Babbel; and Dun Xiao, Co-founder of 17EdTech - here. Todd Rose of “End of Average” Fame interviewed CZI co-founder and Facebook founder spouse Priscilla Chan, and JD Vance weighed in on reimagining rural education. Start ups pitched, established companies debated, and investors hovered and engaged. Indeed so many of the entrepreneurs who are leading global companies talked of their struggles as children - as refugees, often being cast aside, failing in school, and suffering once unimaginable traumas, making their work, and their companies, personal passions as well as successful endeavors. Finally, Jeanne Allen led a provocative panel discussion “No Struggle, No Progress - An Argument for a Return to Black Schools,” which was kicked off by Howard Fuller, who was joined by leaders of two outstanding schools, Candice Burns, of Friendship Charter Schools; and Lloyd Knight, of TC Howe in Indianapolis. That session will be featured next week, on Reality Check. But don’t take our word for it. Listen for yourself! Reality Check captured the flavor of the confab, interviewing for the weekly podcast unique actors working to drive exponential impact from “pre-K–Gray”. This episode features 7 outstanding innovators. Listen in to just a smattering of what’s happening in the landscape and tune in tomorrow for the next installment of “Reality Check Live at ASU GSV 2019”. Don’t forget to subscribe to Reality Check with Jeanne Allen wherever you enjoy your podcasts. And let us know if you have any ideas on how we can bring these and more critical stories of education innovation and disruption to more people. We will return to our regularly scheduled newswire programming next week – unless we discover some more disruptions worth waiting for! Until then, be sure to follow @edreform on Twitter and let us know what we can do to help you accelerate education so that all participate in the future.